Harry A. Vest, age 89, passed away peacefully with his family by his side on Sunday, December 31, 2017. He was born in Pond Creek, Oklahoma on December 25, 1928 to Eleanor Bailey Vest and William T. Vest. 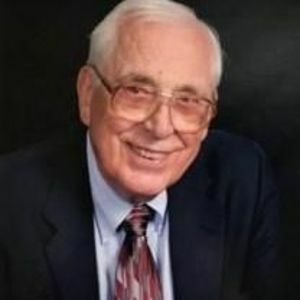 He graduated from Oklahoma A&M College in 1951 with a BS in Geology and in 1957 received his MA in Geology/Petroleum engineering from The University of Texas at Austin. In 1960 he went to work for Continental Oil Company in Libya where he met his wife Zoe in Tripoli and they were married in Rotterdam, the Netherlands on December 28, 1965. Working for Conoco, he was transferred to Dubai, Trucial States in 1966 where he was one of the geologists on the Fateh oil field discovery well, a discovery that helped launch Dubai into its oil era. He would go on to serve as Chief Geologist for Dubai Petroluem Company from 1969 to 1982. After transferring to Houston, Texas in 1982 he retired in 1985 and lived the rest of his life in Houston. He was a Legion of Honor member of the AAPG, AIME, and a long time member of the Houston Geological Society. An avid reader with an ever present sense of humor, Harry enjoyed his retirement and kept his mind sharp by working the crossword puzzle every morning over coffee and breakfast. Having traveled extensively throughout his long life and career he always had an incredible story of by-gone adventures in far away lands. He is survived by wife of 52 years Zoe Vest, his three sons and their families Steven and Mandy Vest (daughter Alexa), Alex and Lizbett Vest (sons Ari and Nico), and Johnny and Lindsay Vest (son Jameson). A celebration of life and interment for Harry A. Vest will take place on Wednesday, January 10, 2018, 12:30pm at Memorial Oaks Funeral Home, 13001 Katy Fwy, Houston, TX.